The ORBITA study randomized ~200 patients in the U.K. with stable ischemic heart disease to percutaneous coronary intervention (PCI) or to a sham procedure—where the catheter was threaded but a stent not inserted, essentially an invasive placebo—which occurred after a six-week period of intensive medical therapy optimization. Six weeks following the procedure, the effectiveness of PCI was evaluated in terms of the patients’ improved exercise on a treadmill. In an accompanying editorial in The Lancet, Dr. Rita Redberg, FACC, MSc, MD, a professor of medicine at the University of California, San Francisco, argued that “all cardiology guidelines should be revised” based on the results of this study—results that showed a statistically insignificant effect for PCI over the placebo procedure. However, a low-risk sample, small sample size, inconclusive primary endpoint and a short-term follow-up are four common issues experts have with the study’s design and its conclusions. Cardiologist Dr. Farhan J. Kwawaja further called into question the sample’s relevance to U.S. guidelines and practice. “Guidelines in the U.S. would not necessarily support intervention” at this level, he said, as quoted by an article on Healthline. Mandrola argues that we can’t generalize these findings to higher-risk groups. Dr. Topol also called into question the study’s primary endpoint—another common refrain for critics of the study’s design. “The exercise time selected as the primary endpoint had remarkable heterogeneity and noise (see 95% CI), even though its increment was nearly 3-fold increased with PCI,” he wrote in the Twitter picture, above. But before we conclude in any hard and fast way in favor of disregarding these findings, we should place this study in the context of practice and further exploratory research. But, is PCI truly not more effective than a placebo? Does this whirl of placebo effect last beyond six weeks? Despite Dr. Redberg’s insistence that the results are “definitive,” as she said to The Atlantic, critics’ arguments and questions are strong and compelling. And that’s not all. 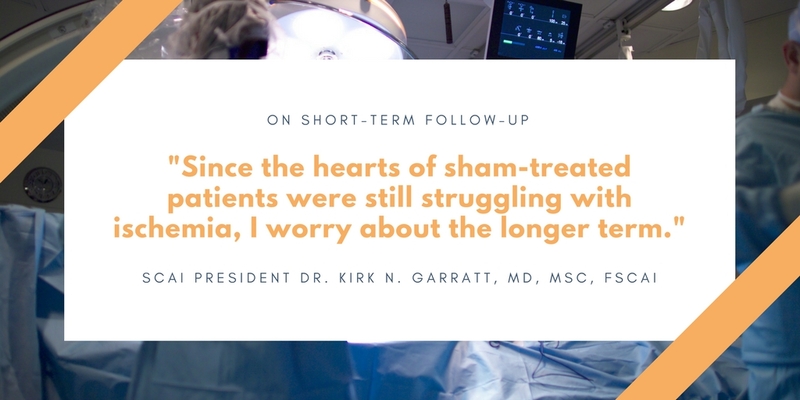 In part two of this short blog series, we’ll look deeper into the implications of this study—arguments about fee-for-service motivations, clinical research for invasive procedures and more. Join our email list to receive updates from the Alliance of Cardiovascular Professionals, like when we post part two!